Michael Gregoritsch scored both of Hamburg’s goals in their Nordderby draw with Bremen. 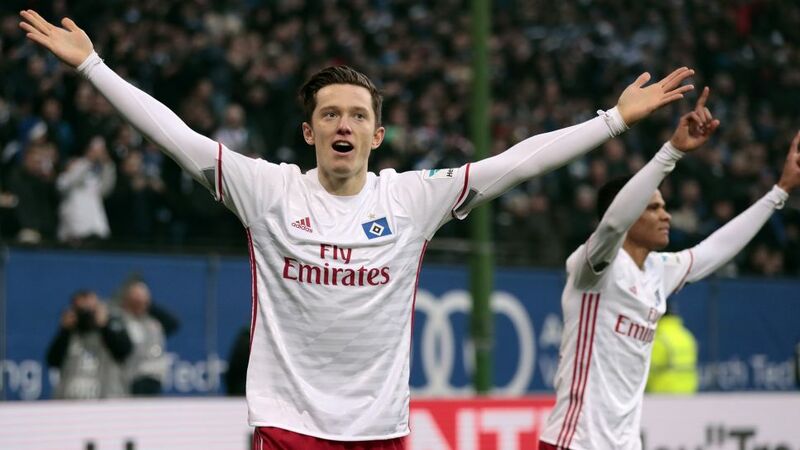 Michael Gregoritsch put in a superlative display for Hamburger SV against SV Werder Bremen, scoring a pair of goals as the Red Shorts drew 2-2 with their Nordderby rivals. Gregoritsch is up to 41 Official Fantasy Bundesliga points. Snap him up here! Gregoritsch’s goals twice gave Hamburg the lead against their bitter rivals Bremen, and but for some slack defending at the other end, Markus Gisdol’s men would have lifted themselves off the bottom of the table with all three points. The Austria international scored a header and one with his right-foot – on current form a perfect hat-trick could be just around the corner. Vote Michael Gregoritsch for #BLMVP on our twitter channel now! Gregoritsch (r.) peels away in celebration after his second goal against Werder. Had more than twice as many shots (7) as any other player on the pitch against Bremen.Scored his first Bundesliga header.Has 41 points in Official Fantasy Bundesliga.